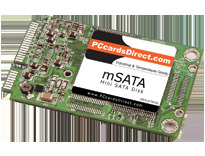 PCcardsDirect mSATA Industrial Temperature rated at -40°C ~+85°C to fulfill various specialized embedded applications in harsh operating environments. mSATA Flash Modules the standard in embedded computing. Offering capacities from 1GB to 16GB temperature rated modules. NAND SLC with the latest ECC wear leveling algorithms giving designers the tools of reliable storage, short design times and fast delivery to market.